Cozy bed and Running shoes? Man, I did NOT want to get out of bed this morning. The alarm went off at 5:10, and I spent the next 15 minutes trying to rationalize why staying in bed until 6 would be a better option than getting up and working out. Thank God I couldn’t find a valid reason, so I got up and did the 30 day shred. Felt amazing less than 5 minutes in, but I’m sure I’ll have the same conversation with myself again in the morning. 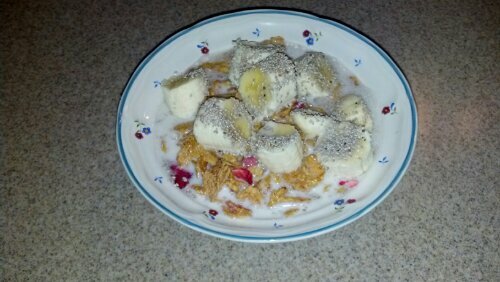 I decided to stray from the usual smoothie for breakfast and went with a bowl of Special K red berries, unsweetened original almond milk, a sliced banana, and tablespoon of chia seed. Steph and I went to a shoe store not too long ago to have our gaits evaluated. Turns out, I’m a pronator. 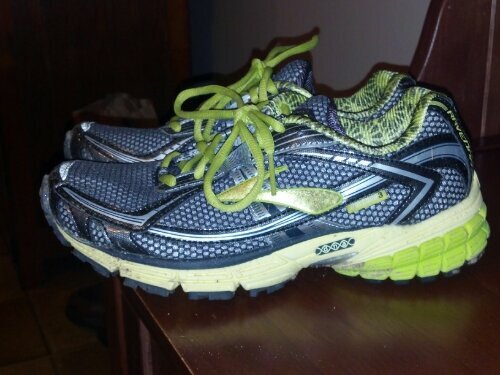 I tried on various pairs of guidance shoes, and ended up going with the Brooks Ravenna 3. I like them, they’re comfy! Problem is, when I wear them, my right foot falls asleep. I’ve been wondering if lacing them differently would help and need your advice! What are your favorite running shoes? Do you lace them traditionally? I CAN help you! Lace you shoes normally until you get to the last two eyelets. make a loop on the same side with the last two eyelets on each side. ( you will run the shoelace thru the big loop you’ve made at the top of each side. Tie normally. This prevents a strangulation effect from tight lacing, and also prevents heel slippage. Not a lot of success yet. I have a hybrid lace job going on right now, and it may be helping a tad. I’m blaming it all on the treadmill anyway! Hoping once I can run on clear roads in the sunshine, I will be able to love the shoes! !